Ariana Grande in the a cappella video for "Dangerous Woman." "Work" continues its reign, while "Dangerous Woman" roars in. Plus, Justin Bieber ties a record. Rihanna's "Work," featuring Drake, logs a fifth week at No. 1 on the Billboard Hot 100 (dated April 2). Meanwhile, Ariana Grande blasts in at No. 10 with "Dangerous Woman," the title track from her forthcoming third studio album. Plus, Justin Bieber ties a top 10 longevity record with his former No. 1 "Sorry." Just like we do every Monday, let's run down all the women and men in the Hot 100's top 10 and more. Highlights of the airplay, sales and streaming-based Hot 100 post on Billboard.com each Monday, with all charts updated each Tuesday. As on the Hot 100, "Work," released on Westbury Road/Roc Nation, spends a fifth week atop the Streaming Songs chart with 34 million U.S. streams, down 3 percent, in the week ending March 17, according to Nielsen Music. The collab also tops the subscription services-based On-Demand Songs chart (15.3 million, down 6 percent) for a sixth frame. It holds at its No. 3 high on Radio Songs (119 million in airplay audience, up 5 percent) and dips 3-4 on Digital Songs (97,000 downloads sold, down 11 percent). The track also rules Billboard's Hot R&B/Hip-Hop Songs chart for a seventh (nonconsecutive) week. "Work" is the lead single from Rihanna's album Anti, which, as previously reported, rebounds 3-1 for a second week atop the Billboard 200. With Anti having first led the Billboard 200 dated Feb. 20, two weeks before "Work" hit No. 1 on the Hot 100, this is the first week that Rihanna has led the lists concurrently with Anti and "Work," respectively. It's Rihanna's second week doubling up overall: Her prior album, Unapologetic, crowned the Dec. 8, 2012, Billboard 200 (for its only week on top) while its lead single "Diamonds" was in its second of three weeks at No. 1 on the Hot 100. As reported when the song reached No. 1, "Work" is Rihanna's 14th Hot 100 leader, lifting her into a solo share of the third-most No. 1s all-time, passing Michael Jackson (13). The Beatles lead with 20 No. 1s, followed by Mariah Carey (18). "Work" is also the record-breaking ninth Hot 100 No. 1 in a row by non-U.S.-born acts (with Rihanna from Barbados and Drake from Canada), while this week marks the record-extending 37th straight week that non-American talent has led the Hot 100. Lukas Graham, led by Lukas Graham Forchhammer, reaches a new peak on the Hot 100, pushing 5-3 with "7 Years." The single from the pop band from Denmark, first a worldwide hit beginning late last year, is the top-selling song in the U.S. for a second week, holding at No. 1 on Digital Songs (125,000, up 3 percent). It also charges 7-3 on Streaming Songs (13.9 million, up 7 percent) and 19-15 on Radio Songs (59 million, up 22 percent). As "7 Years" ascends, two songs each drop a spot to round out the Hot 100's top five: Twenty One Pilots' No. 2-peaking "Stressed Out" (3-4), which also tops Billboard's Hot Rock Songs chart for a 13th week; and Flo Rida's "My House" (4-5), down from its peak. "House" ranks atop the Pop Songs radio airplay chart for a second week. Zayn's "Pillowtalk" remains at No. 6 on the Hot 100, after debuting at No. 1 six weeks ago, and reaches the Radio Songs top 10 (13-9; 69 million, up 7 percent). Zayn previously tallied two Radio Songs top 10s with One Direction, the No. 5-peaking "What Makes You Beautiful" (2012) and "Story of My Life" (2014). At just five weeks, "Pillowtalk" enters the top 10 faster than both "Beautiful" (eight) and "Story" (nine). Zayn's debut solo album, Mind of Mine, arrives Friday (March 25). G-Eazy and Bebe Rexha's "Me, Myself & I" holds at its No. 7 Hot 100 peak. It leads Billboard's Hot Rap Songs chart for a seventh week. Meanwhile, "Love Yourself" has spent its first 18 weeks in the top 10. The lofty chart lives of "Love," "Sorry" and "Mean," Bieber's first three Hot 100 No. 1s, further underscore the success of parent album Purpose, which itself has tallied its first 18 weeks on the Billboard 200 in the top five. More about Purpose: the set's new single, "Company," climbs 89-77 on the Hot 100 (and 25-21 on Pop Songs). At No. 9 on the Hot 100, DNCE's debut hit "Cake by the Ocean" stays in place, keeping at its best rank. Capping the Hot 100's top 10, Ariana Grande soars in at No. 10 with "Dangerous Woman." The steamy song launches at No. 2 on Digital Songs (118,000, following its March 10 arrival) and No. 15 on Streaming Songs (9 million, with nearly half from Spotify clicks), while adding 24 million airplay impressions. The song is Grande's seventh Hot 100 top 10 (and fifth to debut in the top 10) and the title track and lead single from her third full-length studio album, due May 20. She performed it (and fellow album track "Be Alright") on NBC's Saturday Night Live, which she hosted, March 12. The arrival of "Woman" is additionally historic for Grande: she is the first artist in the chart's 57-year history to debut in the top 10 with the lead single from each of her first three albums. Her debut single, "The Way" (featuring Mac Miller), began at No. 10 on April 13, 2013, introducing her first LP (and first Billboard 200 No. 1) Yours Truly. (The song would peak at No. 9.) On May 17, 2014, "Problem" (featuring Iggy Azalea) soared in at No. 3 (before peaking at a career-best No. 2), setting the stage for the No. 1 Billboard 200 entrance of My Everything. If this stat sounds familiar, we noted it in November when Grande's prior top 10, "Focus," debuted at No. 7 on the Hot 100 (its peak). At the time, "Focus" was believed to be the first single from the LP Moonlight. The set's title was subsequently changed to Dangerous Woman, however, and the title song became the new lead single, as "Focus" will not be on the new set, according to Republic Records. Just outside the Hot 100's top 10, Meghan Trainor's "No" slips a notch from No. 11 to No. 12 in its second week, but keeps its bullet for its gains in airplay and streams (and should surge following today's release of its official video); Fifth Harmony's "Work From Home," featuring Ty Dolla $ign, rebounds 16-13 after debuting at No. 12 two weeks ago; and Zara Larsson and MNEK reach the top 20 with "Never Forget You" (22-19). Find out more noteworthy news in the weekly "Hot 100 Chart Moves" column to post later this week. And, visit Billboard.com tomorrow (March 22), when all rankings, including the Hot 100 in its entirety, will refresh, as they do each Tuesday. 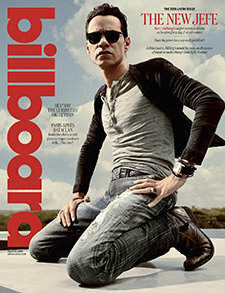 The Hot 100 and other charts will also appear in the next issue of Billboard magazine, on sale Friday (March 25).